Arnaldo Tirone Filho – The opposition candidate is 60 years old and has been a member of the club since 1955. He has strong links to former presidents Mustafa Contursi, Afonso Della Monica and Carlos Facchina. Tirone is also linked to Roberto Frizzo, the candidate defeated by Belluzzo two years ago. Paulo Nobre – At age 42, the lawyer and rally driver is the youngest of the candidates. With more innovative ideas, he has the support of well known figures: Gilberto Cipullo, Seraphim Del Grande, Savério Orlandi and Genaro Marino: all former directors of Palmeiras during Belluzzo’s presidency. 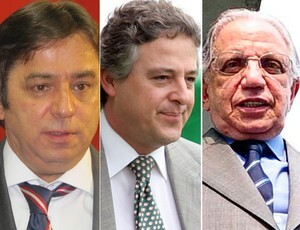 Noble ranks as a “third option”, refusing to run as vice of Salvador Hugo Palaia, thus causing a rift in the electorate. Salvador Hugo Palaia – 77 years old, the real estate business man is a controversial figure. Palaia has held various management positions at Palmeiras for more than three decades. As Belluzzo’s vice president, he assumed the command when the President suffered health problems and needed a 45 day rest. Still very inexperienced in the twists and turns of Palmeiras’ political life, this blogger nevertheless has a firm opinion: all the best of luck in the elections, Mr Nobre!